The relics of the complex of temples in Cambodia has become the symbolic image of the whole country. There are many temples situated in Siem Reap and each of them has an own distinctive beauty. Most of them bring to the tourist the feeling of historical power. 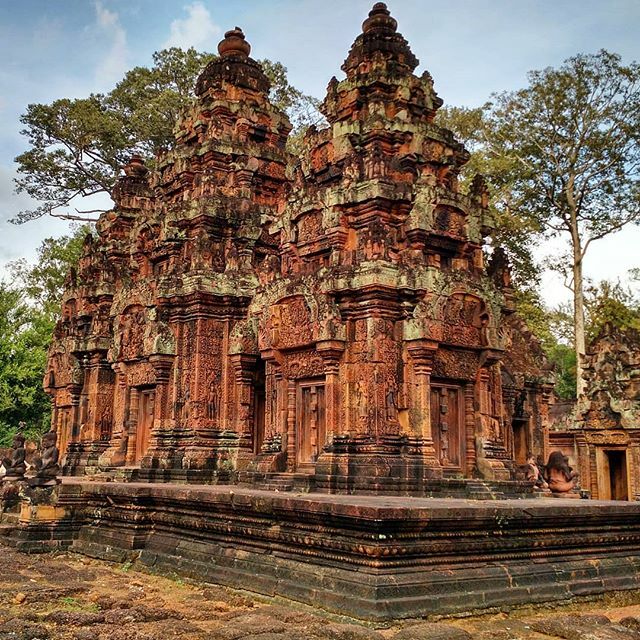 However, if you want to find another aspect of the temples’ beauty – which is more graceful – Banteay Srei is your perfect choice. 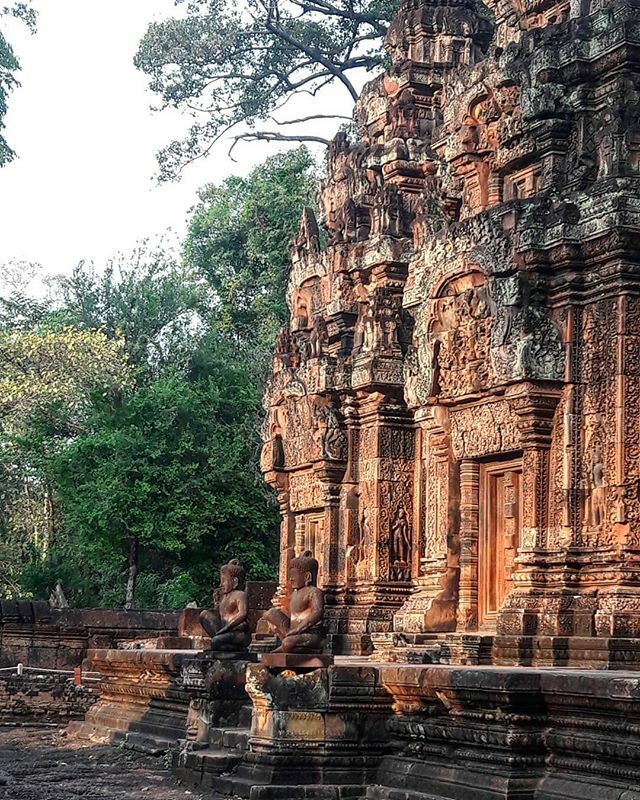 Banteay Srei temple will provide you a graceful beauty satisfy your wanderlust. Let’s explore the beauty of the temple called as “a precious gem of Khmer art”. Banteay Srei temple is the only major temple built by the member of the monarch. 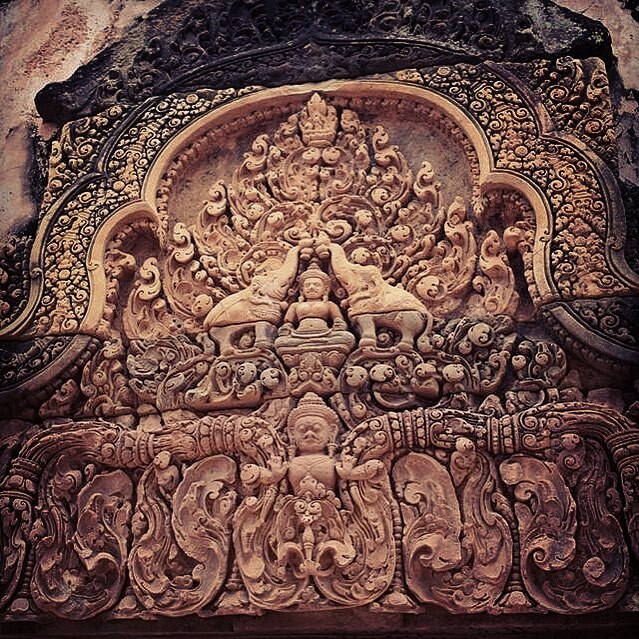 Because of this special construction, Banteay Srei is different from other temples in Siem Reap. This temple was built in 967 AD by Vishnukumara and Yajnavaraha (who was the counselor of King Rajendravarman II and also the teacher of King Jayavarman V). This temple mainly dedicated to Siva – God of Destruction. In the past, this temple’s name was Tribhuvanamaheśvara related to Siva. Nowadays, this temple has its modern name is Banteay Srei which means the citadel of women or citadel of beauty. This name derived from its pink color of the limestone and the carving of the devatas on the temple’s wall. The temple contained 4 enclosures. It was built by the pink sandstone which can be carved on. This special material makes this temple become popular for its beautiful lintels and pediments. Because of this special color, the temple has so graceful beauty that can not be found in any other temples. The pediments are the triangular stone above the gates. On these pediments, they carved the scenes from the ancient myth Ramayana so that each of them will tell you a single story. 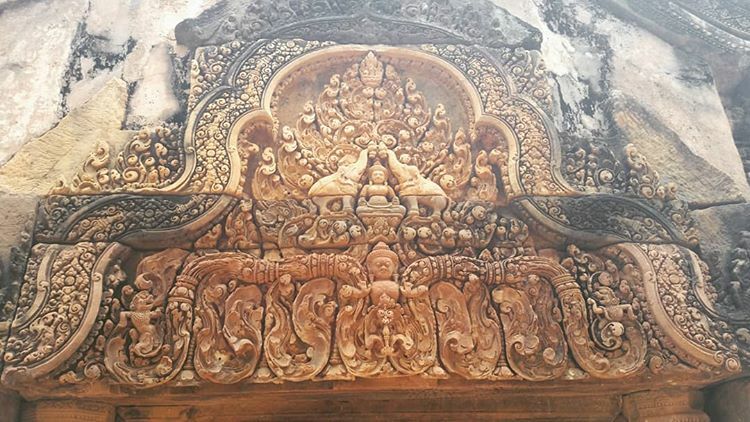 In Banteay Srei temple, not just the pediments but also the lintels were carved by the special details of decoration. The outer enclosures include fourth and the third enclosures. The fourth closure is the outer one which contains the main way to the eastern gate. The galleries on two side lining up and make a walkway between. On both sides of the galleries is the skillful ornamentation. One side is the image taken from the Ancient Epic Ramayana that Rama’s wife – Sita abducted by Viradha. The other side is the image of Indra riding on his three-headed elephants – Airavata. The third enclosures are occupied by the moat. In the past, the moat was full of water but now it completely dry. At the end of this enclosure and the two gopuras (towers) on both direction East and West. The second enclosure is situated and connected the outer enclosures and the inner enclosure. In the western gopura, you can find the bas-relief showing the fight between the monkey king Vali and Sugriva because Vali robbed the throne of Sugriva. From the bas-relief, you also can see the depiction of the prince Rama helping Sugriva fight with Vali. In other pediments, there are different images rooted from the myth: the image of Karaikal Ammaiyar – a woman saint of Siva, the half lion half man Narashima fought with a demon. There are three parasats in the first enclosure. The central tower is the tallest one among these three. It is over 10 meters in height while other towers are shorter. As other places in the temple, the lintels in the first enclosure are also carved by the depiction from the ancient myth Ramayana. These carved ornamentations reflect the religious belief of the ancient people and the traditional culture of them. These carving are in the second enclosures. All of them are taken from the scenes in two ancient myth Mahabharata and Ramayana. Each of them will tell us a piece of the story from these myths. Moreover, we also can see the religious life of the Cambodian. The character in these carving is the God of Destruction – Siva and some other gods. This carving shows a scene from the ancient epic Mahabharata that the God of sky Indra is calling the rain to put out the fire set up by the God of Fire Agni. This fire was created to kill the snake king Takshaka who lived in the Khandava forest. On the same side with Agni, two heroes Arjuna and Krishna are creating a shield from the arrows to stop the rain from Indra. This carving is on the southern gallery. In this carving, Siva is seating on the mountain Kailash – his home with his consort Parvati. The mountain is presented by titering. Each tier has the people and animals who are very panic. In the middle of the carving presenting the demon king Ravana with ten heads and twenty arms. He is shaking the mountain which Siva is sitting on. Siva uses his toe to press the mountain down and traps Ravana under the mountain more than 1000 years. Kamadeva is the god of love. In this carving, Siva is sitting next to Parvati who is not his wife yet at this moment. Kamadeva is shooting his love arrow to Siva to make him fall in love with Parvati. Siva gets angry because of that action so that he gazes at Kama by his third eye and burn him into ash. The mountain in this carving is also separated into tiers. Banteay Srei is not just a temple but it is also the name of this district. Today Banteay Srei has developed its tourism so that there are many other things you can do while staying here besides visiting the temple Banteay Srei. First, you can come to visit The Angkor Center for Conservation of Biodiversity (known as ACCB). This is the place where the animals are rescued and will be reintroduced to nature as soon as possible. When you come here, you can see many pieces of animal living here. If you want to experience the local life as well as a fan of dragon-fruit, we’d recommend you the Dragon Farm. They provide you the homestay service so that you can stay here in a few days if you want. In the days that you stay here, you can join in growing the dragon fruit, try the ripe ones and talk to the local people. One of the most famous tourist attraction in Banteay Srei is the Cambodia Landmine Museum. 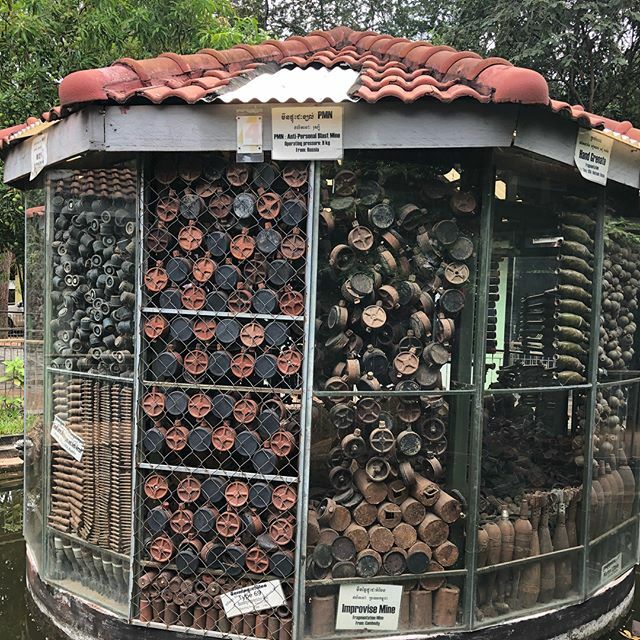 This museum aim at educating people about all kinds of landmines used in Cambodian civil war and its profound effect on Cambodian people. Coming to this place, you can see the destruction of the war in the life of the Cambodian. The crime from the past still left the result till now. If you stay in Siem Reap and you want to go to Banteay Srei, the bicycle is also on the suitable list for you. It can be more convenient if you want to stay in Banteay Srei district. You can rent the bicycles from the homestays or the hotels. Going by tuk-tuk is the experience that you should not miss when you come to Cambodia. This is the most popular mean of transport in this country. It is also very convenient that you can travel around without schedule. The price for tuk-tuk is also acceptable. You can ask the hotel to call you a tuk-tuk whenever you need. It will take about 30 minutes to go there from the Angkor complex. Choosing tuk-tuk to get there, you will have the opportunity to see the village and paddy field on the way you go. A minibus is the best choice if you travel with a group of friend. You can ask the hotel for arranging a minibus for your one-day tour. 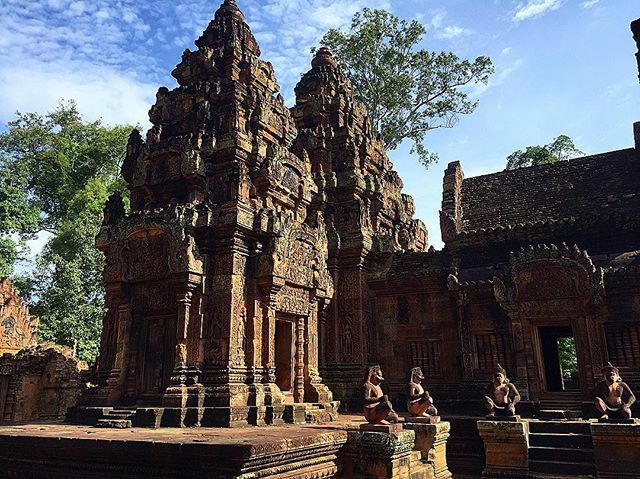 The best time to visit the Banteay Srei temple is in the early morning or late afternoon because the weather will not be so hot so that you can enjoy the temple and explore its beauty more. In this time of the day, you also can avoid the crowd and noise so that you can relax and enjoy your tour. The ticket fee for the Banteay Srei is included in the entrance fee of the Angkor complex. You can not but the separate ticket to this temple. It will cost about 37$ for a one-day tour. 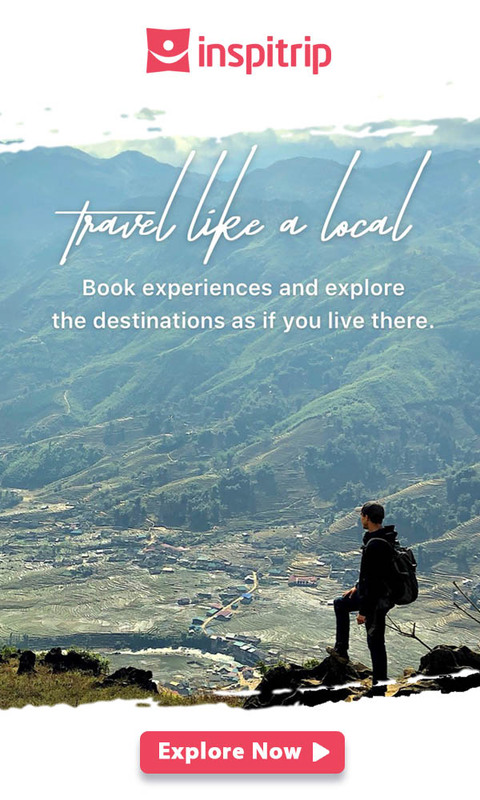 However, it is quite difficult to explore the complex completely just in one day so that we highly recommend you to buy the ticket for 3 days which costs 62$. Banteay Srei temple is quite far from Siem Reap. Therefore, it will cause some problem to you when you want to explore this temple because you need to go between Siem Reap and Banteay Srei. If you come here in the early morning or late afternoon, you need a place to stay. Even though the tourism has been developed in Banteay Srei, finding a hotel with acceptable price and near the relic is not easy for you. Besides you also have to buy the ticket to get into the Angkor complex before coming here. You should not buy the ticket from the strangers or even from the receptionist in your hotel unless you will get a higher price and have a plan for your trip because there are many temples in Angkor temples so that if you have a plan you can explore more temples. You will wonder how many days that you should stay to enjoy the Angkor complex and which temples should you choose to visit. Besides, when you come to a strange place, even though it is very beautiful, you can not understand its grace because you do not have any information about the relics. 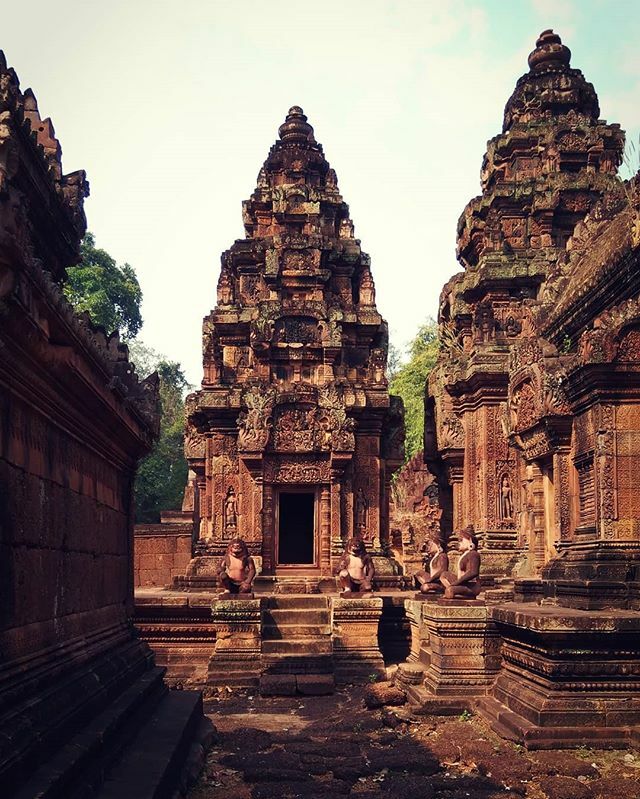 Because of these above reasons, we recommend you to book a Banteay Srei temple tour so that you do not have to worry about anything because we will help you cover everything you need.